Dear Readers, last week I was summoned to the shed and told to ‘bring my camera’ by my husband, who was out topping up the bird feeders. We have several metal containers to keep out the vast array of rodents who pop in for a snack, and a plastic swing bin to top them up. Well, someone had had an adventurous few days. 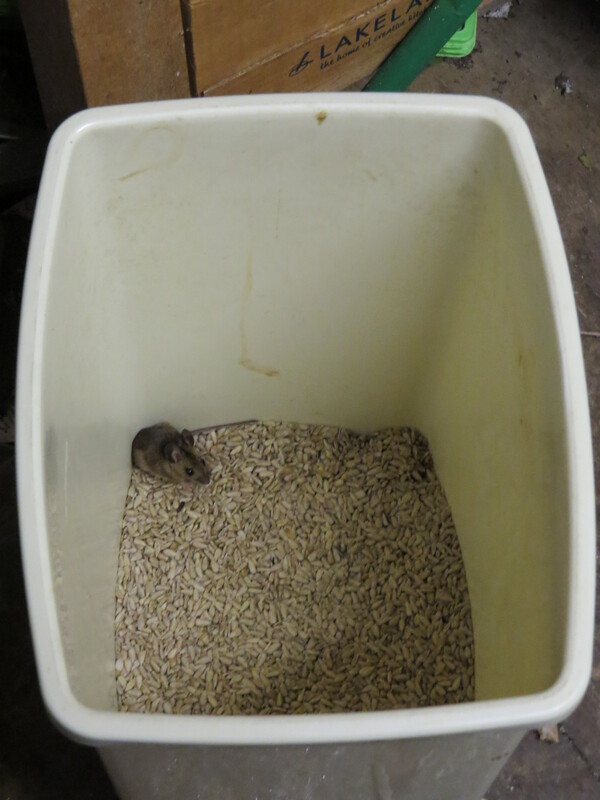 It is probably a week since we last opened the bin, and in the meantime, a woodmouse had jumped in and had been unable to scramble out again. The poor creature was fairly portly, but s/he must also have been desperately thirsty, and terrified. How long had s/he been in the bin, desperately trying to get out, jumping up again and again, trembling every time s/he heard us rummaging about in the shed? What did s/he understand about the situation? It must have been as incomprehensible as it would be for us if we were captured by aliens and taken up to the mothership. Animals are so extraordinarily present, so embodied compared to us. They are fully absorbed with whatever they are doing, be it laying in the sun, or stalking a bird, or hiding from a fox. 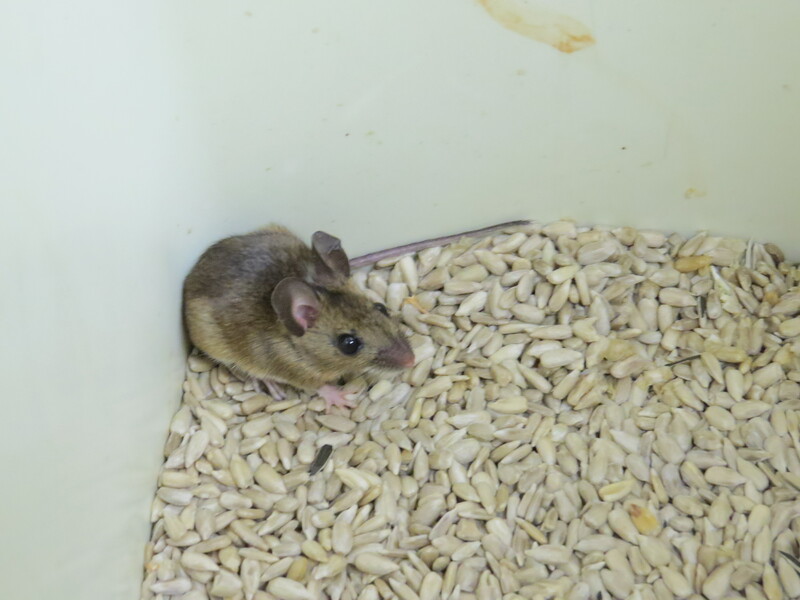 I suspect that their emotions are absolute, and what gripped this mouse was absolute terror. But as always with animals at the mercy of humans, there was a kind of acceptance about this creature, as if s/he was asking me what was next. I see a similar look in the eyes of domestic animals being transported to the slaughter house. I took one or two more photos of the little mouse and then I let them go under the hedge. A quick leap and a few seconds of scuffling and s/he was gone. I hope s/he found a drink, and a place to hide and recover after their ordeal. All paths seem to lead back to what’s going on in Dorset with my parents, and this was no exception. I was talking to the staff nurse about my mother, and she remarked that she thought of my mum as a little dormouse, all curled up in her bed and slow to wake. And when I went to visit earlier this week, there she was, snug as the proverbial bug. I sat down next to her and held her hand. She roused and looked at me with an expression of utter incomprehension and fear. ‘Who is it? ‘ she said. ‘It’s me, Mum’, I said. She stared at me for a moment, and I thought that she still didn’t know. But then she visibly relaxed and squeezed my hand. ‘Of course it’s you, I’m just being silly’, she said. ‘But I have had a very peculiar day’. She proceeded to tell me how her day had been broken up into little shards of time and space. ‘I was having my breakfast and then it wasn’t there. Someone was shaking my shoulder and then the physiotherapist was here, but he was on his own so he couldn’t do much because I still can’t walk. And then you were here’. Some of this is being in hospital, of course – both Mum and Dad lose touch with reality when they’re on a ward. Some of it is being tired. Some of it though is failing cognition. Will there come a point when she won’t recognise me at all? And if that comes, will she recognise at least that I’m someone who loves her and doesn’t mean her any harm? I push that thought away, and start to feed her a homemade creme caramel, her favourite. After two minutes she grabs it herself, and eats the lot. This is good news, for sure. The staff nurse tells me that Mum is now medically fit to leave hospital, but still can’t stand unaided, and so they are going to transfer her to a community hospital in Wareham, where she’ll get the rehab that she needs. It’s a place with only one ward and relaxed visiting hours, so hopefully she’ll get a bit more attention than is possible in a busy hospital. I go home to dad, who is still under the impression that Mum is his mother for a lot of the time. Initially we kept trying to explain the situation, and I do still try to help him understand who is who. He is really shocked if I tell him that his Mum died over twenty years ago, and it almost seems cruel to do so, but it’s breaking my mother’s heart. ‘Oh’, he says, suspicious. ‘If you say so’. And yet he remembers exactly where the doctors surgery is when we visit later in the week, directing the carer there and telling her to slow down as we trundle through Milton Abbas as there’s a 30 mile per hour limit. Dad is itching to drive, but we have deterred him so far, because he has been so poorly with his chest and his confusion. I have a feeling though that if he sat in a car all those automatic reactions would take over and he would be fine. He was always an excellent driver, and gets so cross with us when we try to dissuade him from popping to the shops in the car. ‘Driving is my life!’ he says, in a burst of unaccustomed eloquence. ‘I promise I won’t drive if I don’t feel well enough. You don’t need to worry!’. But worry I do, of course, because it’s ingrained now. However, I have to recognise that my span of control is limited, and that Dad is still a power to be reckoned with, even if half the time he has no idea that I’m his daughter. He was always a great bull of a man, stubborn and single-minded and, whatever else is happening to him, that remains unchanged. As with Mum, I think it’s that cussedness that’s enabled them to survive so far. It’s such a narrow line between giving them the respect that they deserve as my parents and as human beings, and trying to keep them safe. Do let me know if you’ve managed to walkthat tightrope without falling off regularly, I could do with some tips! This entry was posted in Uncategorized on September 1, 2018 by Bug Woman. Oh driving such a tough issue we had to insist my late father didn’t drive after we had spoken with his GP who said he had no power to medically ban him from doing so. We also persuaded him to sell the car and also insisted the local car dealer who was his friend didn’t sell him another one! Hope you have a fabulous trip whale watching and I am sure your brother will hold the fort in your absence. Well done fornfreeing the little mouse too at least he had plenty of food in his cell….I bet he doesn’t ever want to see another sunflower seed again! The tightrope balancing act is hugely difficult and I didn’t ever get it right all of the time. It’s perhaps a tired cliche, but all you can continue to do is your best. Not everyone is the same – I cope best when I know as much as I can (my husband prefers to know very little). When I went through something similar with my mum and now with my aunt, I kept asking doctors, nurses, friends, people visiting other patients for guidance, ideas. It might be worth asking if the ward pharmacist has checked your mum’s medications – doctors are great at knowing what might work, but don’t always think about interactions enough. Also, has either of your parents (and perhaps particularly your dad) been assessed for dementia? You and they might not want that, but it does open some avenues of help. The car is a real problem. I did get my mum to agree to stop driving, but she never got over her sadness at its loss and what it signalled. She wasn’t safe though – too slow in mind and reaction to cope with the speed and aggression of driving today. I’d say better the sadness at the car’s loss than perhaps dealing with an accident. I so hope that your time away allows you to recharge your batteries and your spirit. We’re glad your mother is improving and that at least when she gets to the community hospital she will get much more individual attention which she needs, hospital staff are run ragged most of the time and unfortunately just don’t have the time. The situation with your dad thinking his mother is still alive is similar to our father convincing himself my sister Bobby was our mother, always calling her by her name. Sometimes it’s more heartwrenching for you as it was for us than it is for them as they’re in blissful oblivion. Although our father never drove, so we didn’t have that worry, we did have to hide his frying pan as he loved to fry sausages and he was getting to the stage when it was too dangerous, we could imagine him with the fire brigade at the house. If we offered to do them it was soon rejected as we could never do them ‘the way he did them’ 😁 What a dear little mouse, so glad you’re like us and believe they have the right to life as does everything, you’ll have to put a ladder in there incase it gets in there again! Oh, that poor little mouse – at least it did not go hungry, bless it. I have no experience of what you are going through with your parents as mine had both died by the time I was nineteen. As for driving, I retired from it in January of this year after my car’s starter motor died. I had never been comfortable drving cars (happier, by far, on my motorbikes) and now I feel that my eyesight is not good enough now that there is so much more traffic on the roads and it is so much faster than it used to be. What a moving post! I love the way you implicitly link the plight of the wee mouse with that of the human race. I hope that you are able to enjoy your vacation. So heart breaking to see helplessness! You saved the little mouse. With your parents you can only protect them so far and then you do have to hope that the care they are getting is enough. I am happy to hear you are going on and adventure! Safe travels! 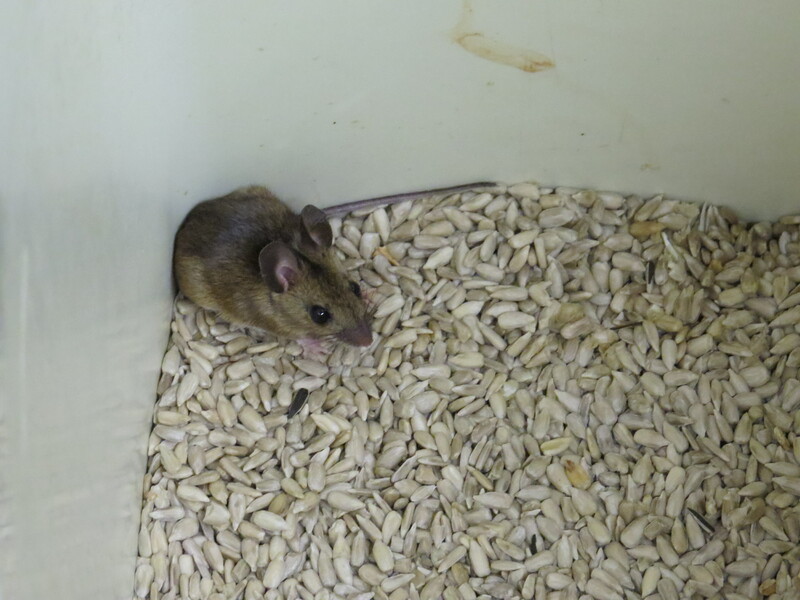 Poor little mouse, I’m glad she escaped safely and had you to set her free. I’m sorry to hear about your parents’ ongoing challenges, but hope that you manage to have a good break, because you do need to take care of yourself as well. That looks like a humpback to me, my favourite whale, one I would love to see in the flesh! 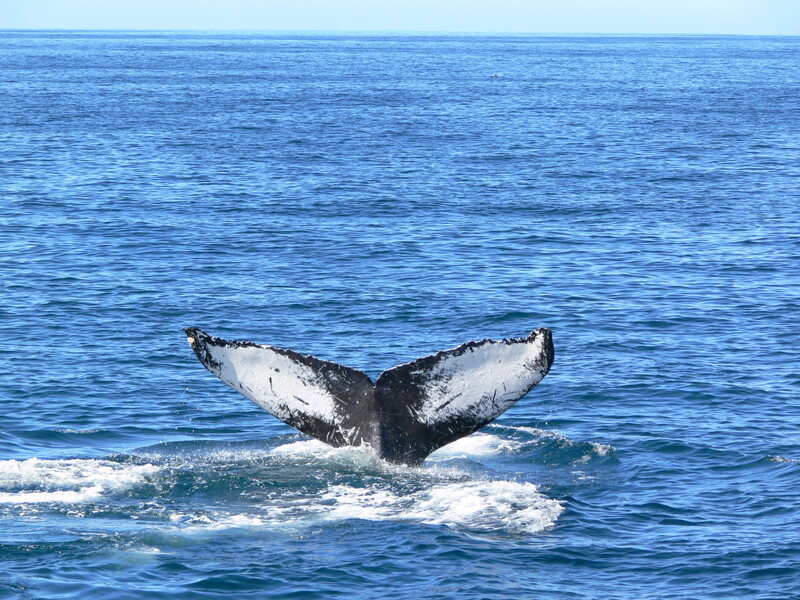 It is a humpback, Andrea….what athletic creatures they are!